EACH ALL GLASS WHISKEY BOTTLE COMES WITH 1-SIDED LASER ETCHING, FULL COLOR APPLICATION, AND WORKING LIGHTS ALREADY INSTALLED INSIDE THE BOTTLE! EMAIL US THRU THIS LISTING IF YOU ARE INTERESTED FOR HAVING EITHER OR BOTH OF THE SIDES LASER ETCHED, TOO, FOR JUST $5.00 MORE PER SIDE. Our store, Trinkets-n-Treasures, is located at 709 10th Street, in Greeley, Colorado. If you want to purchase and pick up your lighted laser etched whiskey bottle(s) from us locally, you may do so. If you have any questions about a local purchase and pickup, feel free to contact us thru this post. We will work with you from there. Our store hours are every Saturday from 9:00am thru 5:00pm, and every Sunday from 10:00am thru 5:00pm. We currently have 39 vendors with booths inside our Greeley, Colorado store, combining for a STORE FULL of shopping options for those who enjoy craft show shopping. We apologize for the length of this post, but we prefer to provide ALL of the options our customers have, and it helps to fully explain them, too. This helps prevent our customers from having to wait for us to return their emailed questions. These are standard all glass liquor bottles. Most of the bottles we use come from commonly recognized brand name liquors, most of which are whiskey or rum bottles. First, we add the all-over color you see depicted in the picture(s) associated with this posting. Then we laser etch the graphics thru the color, and into the glass. The final touch is added when we insert a strand of white Christmas lights into it. 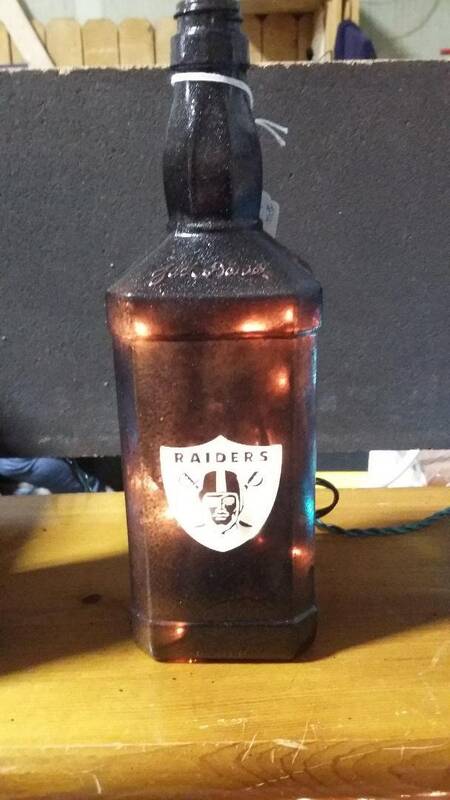 This particular lighted color liquor bottle option depicts the highly recognized Oakland Raiders team logo graphic llaser engraved onto the front side. It's difficult to show just how nice this lighted liquor bottle light looks in pictures, but we tried providing two for you with this post. It is sure to start some fun conversations as you simply display it where it can easily be spotted by friends, family, etc. This bottle was prepped using a color we call, "Moonlight Metallic Black," which is difficult to show clearly on camera. We tried to show a lighted view with the room lights turned off as well as another one with the lights turned on. This is a lightly textured surface color that is a deep black, but has millions of tiny gold crystals in it. For just $5.00 more per bottle side, we can customize your color lighted bottles by adding something to either or both of the sides, too. You're probably not going to want to add anything to the back sides, because that is where we drill the hole near the bottom for the powered light cord to exit. Simply let us know what you wish to add at the time of your purchase. We will then send you a separate invoice directly thru PayPal to cover the additional work you're requesting, and then work for you from there in getting your order created and shipped as soon as possible. We will ship your stock or custom laser etched color lighted liquor bottles within anywhere from 2 to 4 days, depending on the time of year, and the size of your order. We strive to ship at least twice per week, every week. All in-country customers who purchase two or more lighted color liquor bottles will receive a FREE upgrade to their shipping to the swifter "Priority Mail" option. That usually saves between 1 and 3 days on the in-transit time your package takes to arrive. This upgrade is given to you automatically, when you purchase two or more lighted color liquor bottles from our Etsy store, and have them shipped to the same address, at the same time. You may combine purchases from our Etsy store in order to receive this shipping upgrade FREE OF CHARGE. You also do NOT have to stay with the color choice shown. You can request your lighted color liquor bottles be made in any of the colors we currently offer. In fact, if you need more than one color lighted liquor bottle, you can order them all through this listing, and then just let us know the colors you want them each made in. Thanks again for shopping here in our Etsy store, and we look VERY forward to helping create just the right laser etched color lighted liquor bottle order for you.